In the warmer months, there’s nothing better than a fresh summer salad, whether you’re dining alfresco at your favorite restaurant or hosting a backyard barbecue. But when you’re munching on lettuce and Fido gives you that longing gaze, is it something you can share? 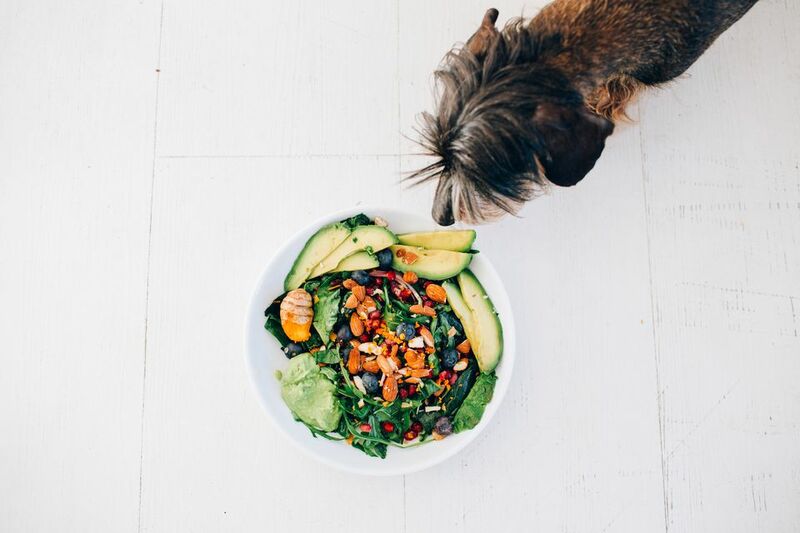 The general consensus is that, yes, lettuce is an OK “human food” option to offer your dog—but salads are definitely off limits. Whether it’s romaine, arugula, or iceberg, lettuce is typically a safe option for dogs because it contains up to 90 percent water. Better yet, lettuce is very low-calorie and does contain a few health benefits, making it a great treat even for overweight or older dogs. Plus, what canine doesn’t love that crunch? Anyone who has ever gone overboard on lettuce or other leafy greens knows that too much of a good thing, in this case, can cause tummy troubles—and your dog is no different. Lettuce needs to be offered in moderation to avoid gastrointestinal issues like diarrhea in your pet. Because of its high fiber content, lettuce can also be harder for dogs to digest when offered in larger pieces, so it’s always a good idea to chop it up before handing it over to your four-legged friend. You may find that your pup prefers the crunchy middle section or the leafy outside portion of the lettuce. Either way, lettuce isn’t easily digestible for dogs of any size, so you’ll still want to offer bite-sized pieces. Pet parents should also be wary of which type of lettuce you’re offering your dog, as some greens have the potential to be harmful. Your four-legged friend may go gaga for greens like arugula, collard greens, spinach, and kale, which all contain vitamins like K and C that can benefit your dog in the same way they benefit humans. But while spinach contains vitamins like A, B, C, and K, it also happens to be high in oxalic acid, which can hinder the body’s ability to absorb calcium and even lead to kidney damage. Another leafy green that contains potentially harmful natural compounds is kale, as is linked to dogs developing kidney and bladder stones, and contains isothiocyanates, which can cause gastric irritation in your dog. While experts agree your pet would likely have to consume very large quantities of these lettuce varieties in order to be harmed, they should still be offered in moderation so your dog reaps the health benefits without any risk. Another cause for concern would be lettuce that isn’t washed thoroughly. Recent recalls have shown lettuce contaminated with diseases ranging from E. coli to listeria, so it’s always important for your pet’s health—and yours—to ensure that lettuce is washed very well before serving. Lastly, while it may be OK to offer your dog lettuce, you never want to let Fido munch on your leftover salad. Salads are often chock full of other ingredients, like onions or walnuts, that can be toxic to your dog. At the same time, toppings like dressings with various ingredients and preservatives can also make your dog ill or lead to weight gain. For that reason, cooked lettuce is also fine to offer, as long as it doesn’t contain other ingredients. While lettuce’s high water content (particularly iceberg lettuce) means that it doesn’t always pack the same nutritional punch as other vegetables, it is a good source of fiber and beta-carotene, a pigment that’s converted into Vitamin A. The nutritional value of lettuce can vary widely between varieties, but in general, experts agree that there are other vegetables that can provide greater nutritional value for your pup, such as green beans and carrots. Keep in mind that there are some veggies and plants that your dog should never consume, including onions, garlic, or chives because of their ability to cause red blood cell damage; rhubarb because it can cause tremors or kidney failure; and mushrooms because certain varieties can be poisonous. As with any “human food”, you’ll always want to be sure to consult your veterinarian before offering lettuce or any other vegetable, as he or she will know best whether it's likely to cause stomach distress or other health issues in your individual pet. Is It Safe for Your Dog to Eat Grass?